Over the last fortnight, we’ve been doing a lot of work to improve the ‘test quality information’ on the MOT testing service. This is information we provide to try and help focus garage managers and testers on where to be vigilant in their work. It’s vital we get this right as helping garages manage the quality of MOT testing is really important for all of us. Since we introduced this feature, you’ve sent us a lot of feedback on how to improve it. So, we’ve listened to what you’ve said and done more in-depth research in garages to understand how we can make it better. We‘ve been busy processing the research findings and have built some prototypes to test. We’ll update you on this in the next one of these blogs! At the same time, we’ve also been carrying out similar work on the ‘Check the MOT History of a vehicle’ service. This service now has over 700,000 people using it a month! This includes people checking when their MOT is due and the history of cars they’re thinking of buying as well as traders and others building up a picture of a car’s history. We want to make the service even better and we’re already working on ideas from the feedback we’ve received, including adding basic garage details to the history. So, again, we’re working through the process of researching, building prototypes and releasing improvements. As well as the big changes you get to see, we’re constantly carrying out work behind the scenes that helps keep the service running. At the end of June, we briefly took the service down for a short while to introduce a software upgrade. This made sure that the latest versions of software were being used. We’ve also been improving the back-end systems which are involved with payment processing. We know the card payments service still isn’t as reliable as it should be and this change will help us move towards making this much better. Doing this type of work helps to make sure the service is always up to date. This is something that happens from time to time when vehicles are misidentified at test. Every few months we match the data up and tidy it to make sure our records are accurate. Last Wednesday (28 June), we reduced the amount of time that you can stay logged into the service whilst you’re not actively using it. This will help keep your account and the MOT testing service secure at all times. We’ve had some feedback from some of you, saying that we haven’t got this quite right - particularly for those of you who use a tablet and record the result as you go. We’re looking at this again and welcome your feedback. I hope this has given you an overview of the work that has been taking place. I’ll update you again soon on how this is all going, but in the meantime, please share any feedback or thoughts in the comments below. After reducing the lock out time to 6 minutes, we received similar feedback from a number of testers saying this amount of time was not enough. So we recently increased the lock out time to 15 minutes. This should be enough time for desktop and tablet users to access the system again providing they log in at least once every 15 minutes. Many garages and dealerships put effort into having their own MOT reminders to get their customers back into them with offers etc. The DVSA seem to be treading into murky waters and potential conflict with the same garages and dealerships who support the industry. What was the feedback on this new service from garages and dealerships? Also, you mention research showed that motorists wanted an MOT reminder from the government. Where is this research? We recognise that many garages do offer reminders to bring business back to them – and see no reason why that can’t carry on. It will continue to form an important part of helping customers get their MOTs on time. Feedback has generally been supportive from the garage industry – it’s in all our interests for more vehicles to be on time. And you are right – we have done widespread user research with motorists and have found the majority would support a digital reminder from government. Given that approximately 30% of motorists are late, then doing what we can to improve the situation is important. For info – we currently have around 27,000 users of the service already. 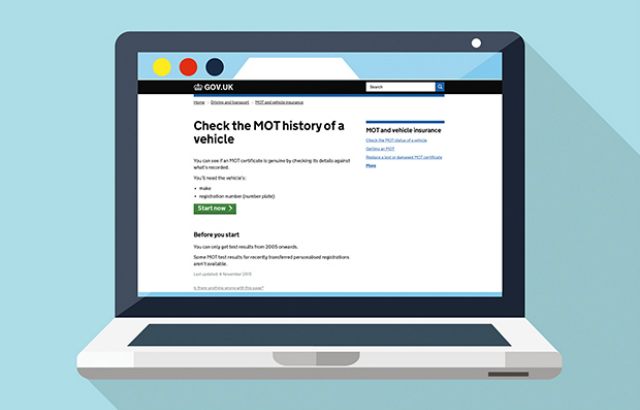 When will an API be available for the 'Check the MOT History of a vehicle' service? We’ll soon be launching a page on GOV.UK where you’ll be able to ‘apply for access to’ the API directly. "Improving test quality information" Im a site manager (not AE or AEDM) and can now no longer see stats for other temporary testers we have had in. I can only see my own stats. Why has this been taken away from me? Apologies for the delay and thanks for re-posting your commnent. There are some changes planned for Test Quality Information (TQI) which will be implemented soon. At the moment, if a tester who is associated with a site doesn’t carry out any tests, they won’t be shown the TQI for those months concerned. One of the changes we’re making will be to show the TQI to all associated testers regardless of whether or not they’ve carried out tests within the relevant period. Its not my job to chase the issue. I've done my bit by letting you know, why don't you tell them? Hi Lloyd, I'll pass this onto them. Thanks again for raising this issue. The word insecure needs some definition. Ive been told by two vosa staff that an insecure headlamp or mirror has to actually be at the point that it's going to fall off to fail it. Yet another has said if one bracket is broken and has movement then it is no longer secure...they can't both be right please can the manual be updated so some closure can me made to the word insecure. Hi Shaun, thanks for posting your comment about this. We're currently completing the drafting of amendments to manuals which are due to be released in May next year, which includes a definition of ‘insecure’. These documents are due to go out for review shortly and if accepted we could look to introduce the definition earlier via a special notice. We realise many garages do their own reminders and I’m sure these will continue to have their own place and work for many motorists. Our research shows us that many motorists would appreciate an official reminder from government, which is why we’ve built the service. It would be helpful if garages could make their customers aware of the new service too as 28% of cars are late for their MOT at any one time and the reminders will help reduce this. I'm sure within our current government the DFT gave DVSA a huge pat on the back for saving over £20million last year, did they acknowledge a significant part of this was due to passing on the IT cost to garage owners who still after 7 years are still waiting on a fee increase? with this huge surplus sat in your bank gaining interest-what is being proposed to help mot garages and how soon will current mot garages be benefitting from this? also seeing on the report the fact saving on water is a high priority for dvsa shows where there priorities lie whilst mot garages are lucky to get 1 visit per 3 years if your a green test station from a VE because of lack of staff and current staff being stretched to the limit in size of the area they cover and the amount of garages in that area- what is being done to improve this? We plan on using the surplus to continue our investment in the MOT service – in particular the digital service. The new service will make your jobs easier and save your businesses money. In terms of MOT fees, DfT have been working on a consultation, but work was delayed by the general election. We’ll keep you updated through email alerts and this blog. We are also conscious that some garages haven’t seen as much of DVSA as they should and we are now working through our plans for how we can get these visits scheduled. Your ‘fidgety’ about us advising unnecessarily (in order to protect our bottoms shall we say?) That reason doesn’t come into your specified advisory guidelines (but it always will in mine). Here’s a mid-way option perhaps. In e-mail you can BCC some third party without the primary recipient/s seeing that they have been ‘copied-in’. In testing then, why not have a radio button that allows us tester to make appropriate advisories and mark them so that they remain outside of the public view but are recorded within the system. You DVSA will then see that the tester scrutinised an item and in the event of an appeal will ‘credit’ him or her with his diligence whilst not ‘scarring’ the vehicle history for life; something that the owner may not want or need to see recorded. The process of recording then remains unchanged (except for the tick-box/button) but remains visible to the VTS and DVSA. Hi Paul, thanks for your feedback. You're quite right – some of the things recorded as advisories are ‘observations’ that are there to record something ‘unusual’ about the vehicle; that aren’t normally aimed at being useful information to the driver of the vehicle. We'll consider your ideas as part of the changes they’ll need to make over the next year. so my answer would be if you don't want the customer to know then its nothing really worth worrying about if you are prepared to let the customer have the car back not knowing all the advisories then to me, the advisories the customer doesn't know about are pointless advisories in the first place, No? These advisories are useful observations to make should there be any later problem with the vehicle, even if you aren’t advising the customer to do anything. Did a Vectra, checked MOT History before starting...Had failed year before on a front sub frame excess corrosion, subsequently could see it had passed...during my MoT clocked front sub frame had been welded all ok? Vehicle came back two months latter, had gone into a local garage for an alternator, owner wanted to show me the front sub frame; went under the motor & front sub frame was rotted out & the under tray was missing. The moral of this story; owner does not need to know that he or she has an under tray fitted but it may help if you subsequently get an appeal. A quote from a gent 'Hooters'; a Landrover I tested today. You know how you get a ‘nose’ for something that isn’t quite right. Well this motor was exhibiting mixed messages in terms of its age and I then spotted just what I needed; different reg. numbers etched on to two rear quarter windows, different to the number plates that is. Apparently new Vin plates with no trim or paint codes, and so on, and on..... I found the Vin No stamped into the frame which matched all else so onwards with the test. An ‘MoT History Check’ showed the ‘alternate’ vehicle of the same colour and failing massively its last test, two or three years ago with MUCH higher mileage and an export marker. I concluded rightly or wrongly that the motor in front of me had an older body on a later rolling-chassis. I guess then that the owner is in the middle of a (very good it has to be said) work-in-progress and as such does not need to be told the obvious. I however, want it on record that this is one car made out of two. I did not ‘advise’ in this case. I did ask this question on 02/05/17 in another thread but it appears to have been overlooked or ignored as it is still awaiting "moderation". This was due to a bug in the system. You should now find that there are no weights showing for classes 1 and 2 so the machine and rider needs to be weighed using the approved equipment. After reading all the coments it seems most agree the scheme is moving forward but in some cases important issues are being overlooked. Promises of basic manual updates have still not been carried out yet management adjustments are being implemented. Let's get the basics right before we address the type and colour of icing we dress the cake with. I noticed neither comments about a price rise has been replied to. I know it's a sore subject but will it be addressed soon? Otherwise the system is very good. The Department for Transport (DfT), who own the rules around fees, have been working with the MOT trade on a consultation on fees. However work was delayed due to the recent general election. Once we have more information on the way forward we’ll keep you updated through our email alerts and this blog. Hi Brian, thanks for your recent comment about log in boxes. As a government agency, there are certain design principles that we have to comply with - the changes to the log in boxes are part of the changes needed to comply with accessibility requirements. Would be good to extend the lockout time and I also suffer with the log in twice problem. It is not all the time, just seems to be when first log in in the morning. System working really well . have no complaints. Hi Andrew, thanks for your feedback, the team are looking to get this fixed by the end of the month. It would be good if when we click on the next page, the cursor goes into the desired box, ie; mileage, reg, brake test, ect, should be easy enough to sort out. What you are working on, is mainly an improvement. But for myself, it's the things, you are not working on, that are the biggest issues. Mainly nothing has been done, to sort out, the cut price testing fiasco and now seven years without an increase in the MOT fee. It was back in December 2016, when Neil Barlow said on this site. We are going to have a consultation on the MOT fee's and discounting early in the new year. What, if any thing, was the out come? Or did it not happen? How long can testing station's survive, with the ever increasing cost's and no financial support. ‘The Department for Transport (DfT) who own the rules around fees, have been working with the MOT trade on a consultation on fees. ‘However work was delayed due to the recent general election. keep up the good work, and thanks for the updates, its all coming together. Chequers 12- 07- 2017. Having to log in twice and then get auto logged out in a short time is very frustrating and reduces test standards . Hi John, thanks for your feedback about this - the team are looking to get this fixed by the end of the month. The test time for being logged out has to be changed i work in a very busy m.o.t center and need continuous access it was fine the way it was so why the need to change it ? seems to be a pointless change when there are other matters with the system that need sorting out enough people are complaining about it other testers i have spoken to have said it was a needless change so can it not just be extended or maybe put back the way it was ? Hi Neil, thanks for your comment, the team are currently evaluating feedback and are looking to resolve this. having tick boxes on the non component advisory so we can tick all the items we want to add then click 1 single button to add them ALL.? on each section we test- is it possible to have the most common items advised and failed at the top of the screen rather than having to scroll down and search for it? this new timespan for which logs us out the system seriously needs extending. you are wasting our time in making us log in/out so often. I strongly second this concern, when inspecting track rod ends the most common cause of failure or advisory is a worn track rod , it is listed at the very bottom of the list . Surely it's a simple fix to move it to the top of the RFR list. This is not a criticism but simply an observation and I hope you accept that if you don't know and accept our concerns then you're unable to act upon them . I run a single MOT bay and find the that admin man hours have increased, also the extra work involved in keeping the three AE's motivated to input training and all the other tasks that the eleven appendixes require us to adhere to, add on top of that the rising costs of eqpt and their repairs, upgrades and re-calibrations and take into consideration the competition we have locally when and if are VOSA going to look at levelling the playing field and putting a standard price list for MOT Tests ?? thanks its looking good cheers . Hi Martin, other users are reporting this and the team are looking to fix soon. I am a DVSA Vehicle Examiner and don't want my local garage being shown. It narrows down your home location to easily. Also a stalker may try to track someone. It's dangerous and has no benefit. I could probably phone a garage feed them some nonsense about having to drop something but can't remember quite their address and bingo stalker/criminal heaven. I do agree that the reduced log on time is now to short. I do not recall a price rise for mot tests for about six years but running costs keep going up every year will the price of a mot test increase. I must agree the reduced time before it logs you out is really REALLY annoying also why have the borders on the boxes change colour I would have thought that your time would be better spent giving priority and sorting out stuff that is known to be deficient and not working properly. Thanks for the info. Can't imagine using a tablet to record results during the test. Haven't tried it though. I would think that keeping the tablet clean would be difficult. High attrition rate on tablets, possibly. Still got to print something out to have something fileable and that emissions results can be attached to. Also recording of brake readings. I love computers (look after about 10 business & home), but sometimes you just can't beat pen and paper. Liking the updates a lot the system just keeps getting better. The question I have is how do we check if a nominated tester has had any disciplinary action taken against them prior to employing them ??? Hi Trevor, thanks for your feedback. You should ask the Tester to request their personal history from DVSA going back 5 years which they then can choose to share with you. Adding basic garage details to the ‘Check the MOT History of a vehicle’ ...is food for thought sounds like a good idea may even improve standards. You need to extend the time before being logged out .since the change it's causing problems. Might be a good idea to have log in for 40 minutes and why can't we have a lock all box for break readings instead of having to manually tick each box why make thing difficult for the testers this is the 21 century it's our time that's being wasted . I personally have to put my log in details in twice it's a pain . Why do I have to enter my log-in details twice if I close the system down e.g. overnight? Other users are reporting this and the team are looking to fix soon. Hi Steve, thanks for your comment, apologies for the late reply. Not all testers and managers are approached to take part in the survey – a proportion of them are selected by the research company. Sometimes emails bounce back if the address isn't up to date - if you would like us to check whether or not the survey was sent to you, please contact us at social.media@dvsa.gov.uk. If you do want to leave any feedback about the service, please click on the feedback link that's located within the service or contact the MOT management team at MOT@vosa.gov.uk. With regards the time limit, the team have had other users reporting this and they’re looking to fix this soon. Any feedback from you is good , we feel part of the "family". Keep it up ! Well done everyone. It's all coming together well. And with the MOT Testing Blog it's a great way to keep us all updated.